I love to make baby quilts and am always glad for an occasion to do so. As soon as I find out someone is pregnant, I await the news of whether it’s a girl or a boy so I can start shopping for fabric. 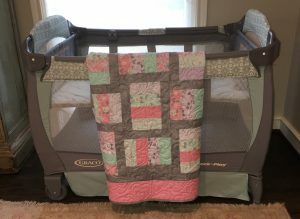 Besides just giving a baby quilt to the expectant mother, I also like to give a quilt to my friends who are first-time grandmas to keep at their houses for when the baby comes over. I recently had the opportunity to do just that. I don’t actually know the expectant mother, but I made a quilt for my friend who is going to be a grandma for the first time. She was so excited to get it and sent me a picture of it hanging on a port-a-crib that someone else had given her. It happened to match the crib perfectly although it wasn’t planned that way. If you know of anyone expecting a baby and would like to give a one-of-a-kind gift, contact me and I’ll be happy to make it for you. If you know the colors and theme of the baby’s room, I can make a coordinating quilt. Even though the name of our shop is Katy T-Shirt Quilts, I do enjoy making other kinds of quilts.